Another example of lovers tattoo. 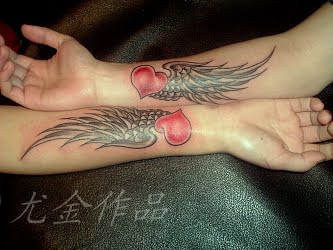 This tattoo piece integrates all the love elements - heart and angel wing (maybe guardian angel). The only thing weird is that although it is perfect for a girl but a little girly for a guy. Also check out this impressive real heart tattoo.